Janet Morgan and her golden retriever, Hannah, feel that making a child smile is a highlight of the Doggie Brigade experience at Akron Children’s Hospital. Agility champion, Rally Obedience champion, and thespian are just a few accomplishments on Quincy Ennis’ resume, but he doesn’t like to brag. In fact, he likes to bark. 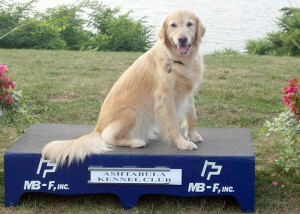 Quincy, an 11-year-old golden retriever, collie and German shepherd mix, is a member of Akron Children’s Doggie Brigade. 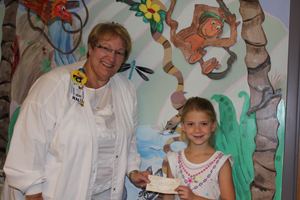 On June 29, 6-year-old Emerson Schmidt smiled widely as she presented a $250 check to Theresa Borodkin, a nurse manager for Akron Children’s Showers Family Center for Childhood Cancer and Blood Disorders. Cancer patients welcomed three very tall and very large Cleveland Browns players into their rooms at Akron Children’s Hospital on June 19. Aerabella was only 9 months old when she was diagnosed with stage 2A neuroblastoma, a malignant tumor that develops from nerve tissue. After 4 surgeries and 4 rounds of chemotherapy, Aerabella is now cancer free. Senior Ryan Anderson’s football dreams were sidelined his junior year when his knee started to hurt. When he discovered there was a tumor in his knee, Akron Children’s Hospital was there to help him with his battle.